A few months ago, we did our first ever Sustainable Nano Reader Survey. We wanted to get a sense of who our readers are, how you found out about us, how often you visit, that kind of thing. 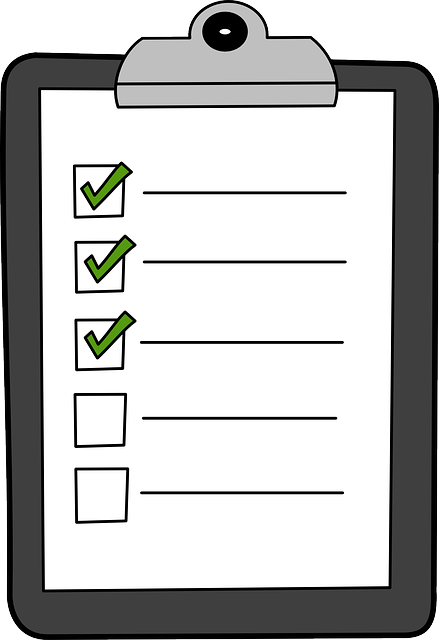 Nineteen people filled out the survey (you know who you are – thank you!! ), which is about a 5-15% response rate, depending on how you look at our visitor analytics for summer readership. That response rate wouldn’t be good enough if we wanted to publish our results in a research journal,1 but it gives us some baseline information to start from as we wrap up our second year of blogging. We want to be able to evaluate over time how well we are succeeding in our goals of communicating with the public about science topics that they care about. Despite the large (if difficult to quantify)2 number of science blogs out there, there is surprisingly little information available about who reads them.3 Dr. Paige Brown Jarreau, a postdoctoral researcher studying science communication in new media at LSU, wrote her doctoral dissertation about science blogging.4 She analyzed how blog content is influenced by author motivations, editorial constraints, and access to information sources. Dr. Jarreau is now working on a follow-up project about the readers of science blogs, and she encouraged us (via Twitter, where she is @FromTheLabBench) to post the results of our little survey. So here goes: results from the first ever Sustainable Nano Reader Survey! 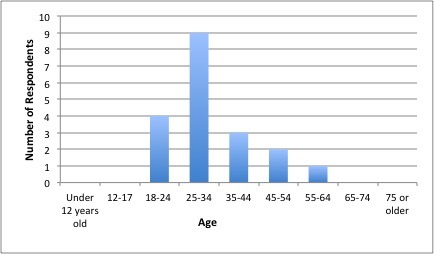 As you can see from the chart below, about half of our respondents told us that they are 25-34 years old, but a handful were older and younger as well. Looks like our readers are mostly young(ish) adults. This kind of demographic information is important to help us evaluate how we’re doing on our outreach goals. For example, we’re pleased that about half our readers are women, but our 89% Caucasian response rate tells us we can do a better job in reaching a diverse audience. We’re happy to see that some of our audience includes scientific colleagues and fellow students – it’s nice to be able to get feedback from peers, and scientists often enjoy public-friendly explanations of science as much as the next person – but we also want to make sure we’re doing public outreach, not just talking to other scientists. We can use all of this information to compare with future survey results and assess our improvements over time. First, 63% of our respondents want to learn about topics that are new to them. That means it’s not just our scientific colleagues who are reading the blog! On the other hand, 58% of the readers said they are here to read something their friend/family member wrote. Given that our friends and family are much more likely than others to actually fill out a survey like this, we can assume that number is probably inflated compared to our overall readership, but it still gives us a clear goal to continue increasing our audience beyond our immediate circle of acquaintances. Finally, only 37% of our survey respondents reported that they read the blog to find ways to explain science topics. We included this item because we have a goal of increasing the blog’s usefulness as a resource for science teachers. Now we have a baseline number so that next time we do a reader survey, we can find out if we’re improving in that regard. We had a few other questions in the survey, about what readers liked and disliked about the blog, how they found out about it, how often they visit, and if/how they follow us on social media (56% Facebook, 32% Twitter). Overall feedback was very positive regarding our choice of topics and the clarity of our writing; one person suggested the site could be more mobile-friendly, which we have tried to address with our new layout. It’s worth reiterating that this was a very small sample from which to draw our conclusions. The nature of the survey also made it so that our results were probably skewed toward people who are either members of the Center or our friends and family. This information is still an important step toward understanding our readers and improving the blog for the future… That said, please don’t wait for the next survey to let us know what you think! Zivcovic, B. Science Blogs – definition, and a history. Scientific American, July 10, 2012. Jarreau, P.B. For Entertainment! For School! For News! For Fact-Checking! Why do people read science blogs? SciLogs. Sept 17, 2015. Jarreau, P. B. All the Science That Is Fit to Blog: An Analysis of Science Blogging Practices (doctoral dissertation). Louisiana State University, 2015.